I think the ancient Egyptians had the right idea in their worship of the sun god. Our own sun is the difference between the cold and dark of outer space and the warm light of our world. Red giant stars explode after a long life, and the destruction of their nuclear furnaces make the heavy elements we depend on for life itself; elements our own sun is too small to forge in its death throes. It is the remnants of these massive red star explosions that formed the earth and made life possible. I further think that tattoos are not pretty. I don’t think I’ve ever seen a square inch of skin that was improved by having ink needled into it. So imagine my surprise when I was sitting in the Lansing bus station last Friday afternoon, and idly looking out the window, when I was struck dumb by a tatoo on a young woman’s shoulder. Besides being a pretty striking sun, it also reminded me of my friend Oren Krumm, who died when he was just 18 years old and a freshman at Michigan Tech. 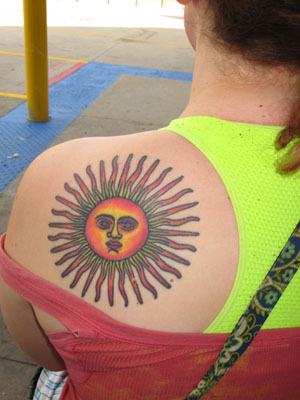 Oren was also attracted to the sun, and I believe he would have been attracted to this tattoo. Without my asking her, she turned her shoulder toward me, moved her hair out of the way, and moved the strap of her blouse down so the tattoo was completely visible. I took my picture, showed it to her, thanked her, and walked back inside. When I got back home, I made a print for Oren’s Mom, and asked Alice to give it to her. We both had misty eyes that day. This entry was posted on Sunday, July 21st, 2013 at 9:53 pm and is filed under Uncategorized. You can follow any responses to this entry through the RSS 2.0 feed. You can leave a response, or trackback from your own site.